This book is all about habits. Life is all about habits. We are creatures of habit and we choose the habits that will ultimately form our lives. First we form habits and then they form us. Good habits are hard to form and easy to live with while bad habits are easy to form and hard to live with. I will be the first to admit that it was easier for me to write this than to practice its content. Experts say that the amount of time it takes to create a habit varies by individuals. My advice is to pick one and work on it until it becomes automatic. Then pick another and another. Before you know it, your life will be changed and in the process you will change the lives of those around you. The habits you develop will determine the quality and outcome of your life. "A quick read with profound relevance in our everyday living. No bag of tricks — rather it is a practical approach to life itself. 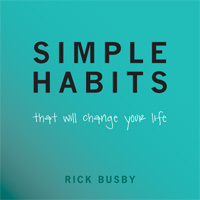 We are all creatures of habit and Rick Busby gives us valuable ones to embrace!" "As a grandmother, I think this book should be required reading for children 10 and up! A copy of it should remain on the coffee table at all times." "All my family, friends, and clients are getting this book as a gift. Rick Busby lives these ideas. He walks his talk. This little gem of a bathroom book is profoundly simple and simply profound!" "Simple Habits is a book that is easy to read and understand. I would encourage everyone to read this book and apply these simple habits in their daily walk through life." © 2010-2019 BuzzBee Books. All rights reserved. Designed and Powered by WAE Technologies, Inc.